There was speculation for years that Juniper would acquire someone like Extreme or Foundry to get into the Ethernet business. But rather than hastily run into a deal, the router manufacturer took its time building its own products, releasing its EX series of switches in 2008. At the same time, Brocade diversified into Ethernet by acquiring Foundry for $3 billion. 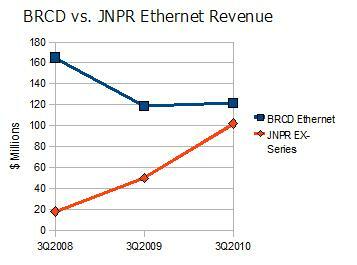 When Brocade acquired Foundry, the Ethernet supplier was doing $165 million in revenue a quarter. In the 3rd quarter of 2008, Foundry's last as an independent company, its rival Juniper sold just $18 million worth of Ethernet switches. 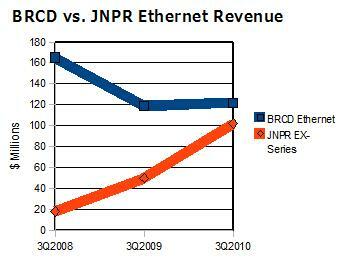 But during the 3rd quarter of 2010, Juniper sold over $100 million of its EX Series Ethernet switches, more than a five-fold increase in two years, while Brocade sold $122 million worth of Foundry-developed products in its quarter ended July 2010, a 25% decrease over the same period. Both Brocade and Juniper have strong relationships with IBM, which resells both company's products. And Brocade has long had a dominant share of the Fibre Channel switch market. But this is what has been interesting. Selling Fibre Channel and Ethernet together under one company has resutled in stagnant Fibre Channel revenue, and declining Ethernet revenue. Meanwhile, in an article at NetworksAsia, a Juniper exec reported in 2009 that over half of its EX switches were being sold with routers. Essentially, just as Cisco has long been able to sell its routers and switches to the same customers, Juniper has been able to do the same, albeit in much lower volumes. Yet, Cisco never needed Fibre Channel switches to sell Ethernet products, and Brocade never needed Ethernet switches to sell Fibre Channel switches. In spite of all the "convergence" hype, SANs and LANs simply do not mix well. The LAN/SAN integration we're supposed to get with Fibre Channel over Ethernet reminds me a lot of the LAN/WAN integration we were supposed to get with IP over ATM. While Cisco probably scared Brocade a bit when it started developing SAN-OS, now NX-OS, companies like Juniper, F5, and Riverbed have had success against the networking giant by focusing on one product category at a time, not by trying to replicate much of its product line, as Brocade is now trying to do. 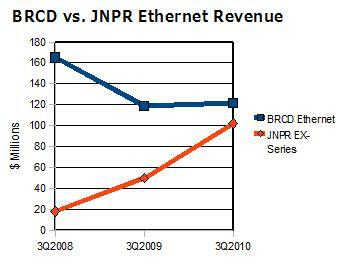 Brocade really just needs to cut its losses in the Ethernet business. The $122 million it booked last quarter in "Ethernet" actually includes the ServerIron load balancer. More importantly, its gross margins for the acquired Foundry products have fallen into the mid-20s. They were in the 60s when it bought the company two years ago. Now I wouldn't count Brocade out as a company, it's been dominant for over a decade in storage networking, but while it thought it could take on Cisco, it has wound up losing to Juniper. And surpass they will. Juniper has been a remarkable company. Their public listing was a hot commodity back then.